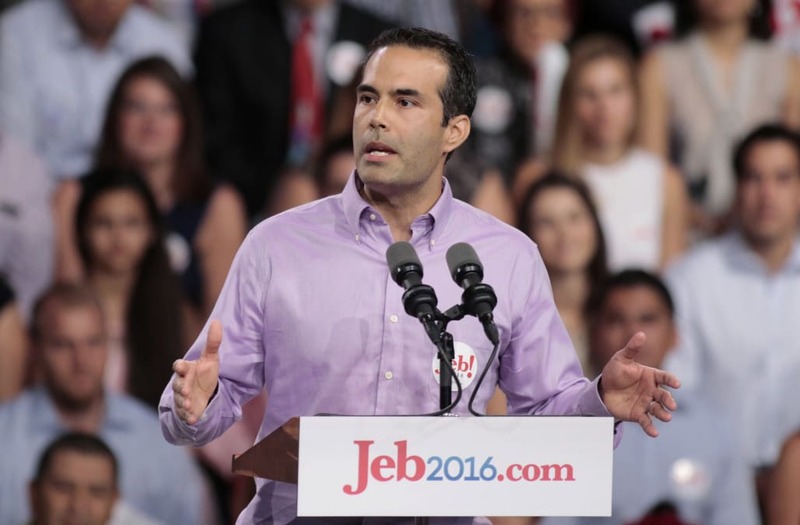 George P. Bush won the primary for Texas land commissioner on Tuesday after touting his continued support of President Donald Trump, a position that runs in contrast to the rest of his family dynasty. Bush referenced his endorsement of Trump in 2016 in a recent campaign ad, and his spokesman Lee Spieckerman has said that Bush has “epitomized” Trump’s Republican party. Bush is the son of the Trump’s presidential rival Jeb Bush― a frequent target of Trump’s mockery― and was the only member of his family to endorse Trump during the 2016 campaign. George P. Bush, nephew of U.S. President George W. Bush, and his wife Amanda address the Youth Convention at the Republican National Convention in New York September 1, 2004. Trump endorsed Bush last week and appeared to hint at the tension. Donald Trump, Jr. also endorsed Bush. Bush decided to endorse Trump in 2016 despite the refusal of the elder Bushes to do so (neither former Presidents George W. Bush, George H. W. Bush nor his father voted for Trump.) Trump had referred to Jeb Bush as a “total stiff,” “low energy” and “an embarrassment to his family” during the Republican presidential primary. Former first ladies Barbara Bush and Laura Bush also declined to vote for Trump, and several members of the Bush clan even supported Clinton. Other GOP candidates in the Texas race similarly played up their alignment with Trump in order to sway voters. Congressional candidate Kathaleen Wall released a campaign video featuring her own life’s parallels to Trump’s. “One says ‘build that wall,’ one agrees in, well, his wall,” the video said. In another campaign video featuring him standing in the middle of a swamp, a “Make America Great Again” hat sitting atop his head and a shotgun in his hand, Robert Stovall said he’s running for Congress to help Trump achieve his agenda. “I realize the swamp is the problem,” he proclaimed.